Modulated, digital delay meets analogue circuitry. Eventide has unveiled the Rose, a super-modulated, digital delay pedal with all-analogue circuitry. Its unique design – built for mixing, filtering and feedback – differs from DSP-based effects, and enables it to produce a spectrum of interesting sounds, including lush textures and experimental compositions. Its circuit design is derived from a variable digital clock which can go from a range of about 200kHz for maximum fidelity and up to 10 seconds of delay, down to about 8kHz for 50 seconds of delay. Two other highlights are the assignable hotswitch and three bypass types. The former can be configured to control different parameters – including Tap Tempo and Delay Repeats – while the latter lets you select between Buffered, Relay, Kill Input bypass presets. 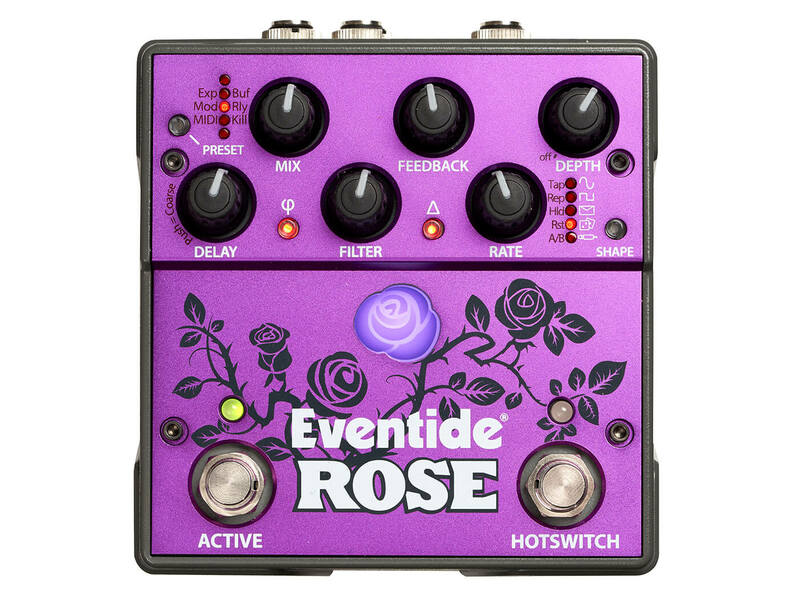 Last but not least, the Rose has MIDI control and a fully assignable aux switch/expression pedal input for increased versatility. Pre-orders at $349. More information at eventideaudio.com.